A rectangle packing library. Heavily tested with random data to ensure that it always produces correct result. Pack multiple rectangles into a larger one. 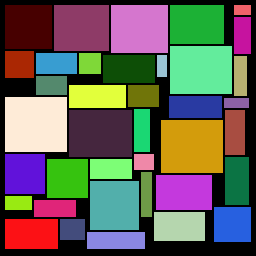 Can be used for packing sprites into a texture for 2d games. Uses skyline heuristic. Heavily tested with random data to ensure that it always produces correct result. Pack small rectangles into a larger one. This is useful for creating texture atlases for the efficient GPU rendering.